Really spicy burn here from Seahawks DE Michael Bennett, after Seattle smothered the vaunted Philadelphia offense and QB Mark Sanchez to the tune of just 10-of-20 passing for 96 yards. "You need to tell the Philadelphia police that they need to put an [APB] out," Bennett told USA TODAY Sports. "Because Sanchez is out there trying to impersonate a good quarterback." Aces trash-talk from Bennett—which we will always, always support—but it's not really fair. 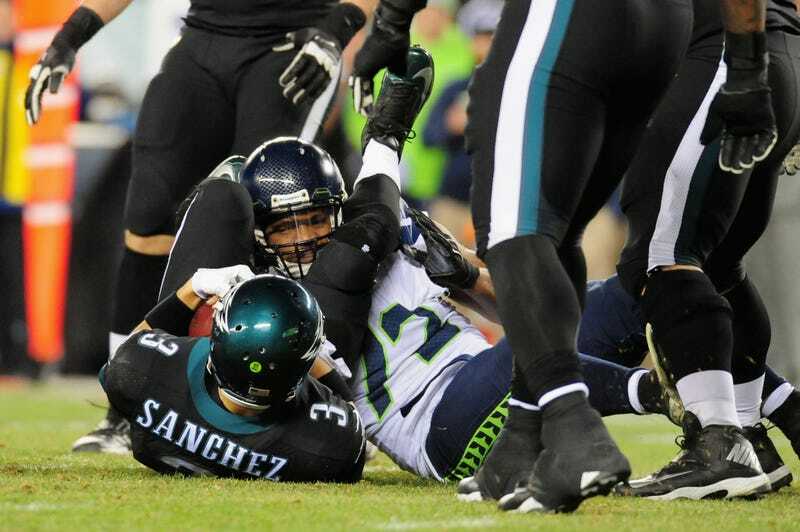 The Seahawks defense is obvious very good, and only now rounding into form. But Sanchez is kind of damned if he does, damned if he doesn't. What outcome for the Eagles' and for Sanchez's season would get the largest number of observers into a lather? Whatever that is, that's the one I'm rooting for.